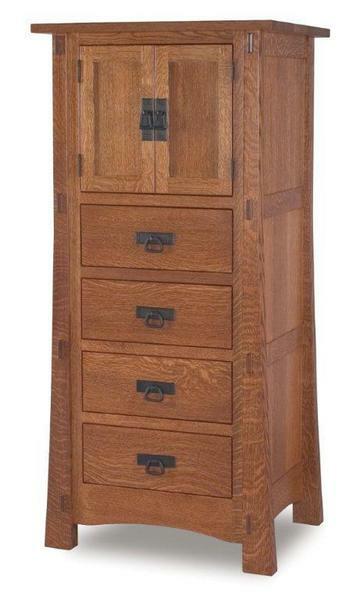 This Mission lingerie chest is Amish handcrafted from solid hardwood. This chest of drawers has a handsome Mission furniture look featuring flared legs, exposed tenons, square Mission tops and flush drawer fronts. Quarter sawn white oak wood and oak wood are the most popular woods for Mission furniture. We also offer a Modesto MIssion Lingerie Chest with six drawers if you do not want the door style. Thank you. I got it, and I love it! Karen P.